Welcome to the latest update from LOMBOK and Silverbean. * 10% off full price decorative accessories. Enter the code DECORFEB at the checkout to qualify for the discount. Valid from 04/02/16 until midnight 29/02/16. * 10% off Shop by Room - Conservatory (excludes sale items). Enter the code CONFEB at the checkout to qualify for the discount. Valid from 04/02/16 until midnight 29/02/16. Please see below for further details and promote onsite ASAP. LOMBOK are pleased to offer exclusive to affiliates 10% off full price decorative accessories. To qualify for this promotion simply enter the code DECORFEB at the checkout. This offer is available from Tuesday 4th February until midnight Monday 29th February. The Decorative Accessories range includes items such as candles, ornaments, picture frames, vases and much more. These beautiful products would make the perfect Valentine's Gift for your loved one. LOMBOK are pleased to offer exclusive to affiliates 10% off Shop by Room Category - Conservatory (excludes sale items). To qualify for this promotion simply enter the code CONFEB at the checkout. This offer is available from Tuesday 4th February until midnight Monday 29th February. The range of beautifully handcrafted conservatory furniture can be mixed with indoor items to craft a peaceful and comfortable sanctuary that you can enjoy no matter what the weather. In Association with LOMBOK Exclusive Affiliate Partners Agency. Elias & Grace – TREAT WEEK 20% OFF! Our popular TREAT WEEK is about to start! We only run this exclusive event once per season and we will offer a site-wide 20% OFF All Autumn-Winter 2015 Collections, including luxury designers as Chloe, I Love Gorgeous, Petit Bateau and many more. To redeem the offer customers need to enter code TREATAW15 in the promotional code box and click apply before proceeding to the checkout. The offer starts on midnight GMT Tuesday 20th of October and ends midnight GMT Tuesday 27th. Excludes discounted items, gift wrap, gift vouchers and shipping. The promo code will be active on www.eliasandgrace.com from midnight GTM Tuesday 20th of October. This exclusive promotion is always loved by customers, generating additional traffic and conversions, and we’re sure your readers will be thrilled by this special opportunity! 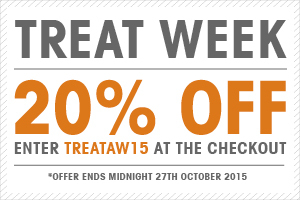 The Treat Week banners and link will be available on the platform from Monday morning. By referring traffic to EliasandGrace.com via banner ads, text links, product feeds and content units, you can earn commission of up to 8% on sales that you helped generate. For any further information do not hesitate to contact us at costanza@eliasandgrace.com or through the platform. If you’re not joined to Elias & Grace click here. LOMBOK are pleased to announce exclusive to affiliates they are offering Free Delivery on all orders for the whole of the long bank holiday weekend. To qualify for this promotion enter the code AUGBH15 at the checkout. This is valid on all orders placed between Friday 28th August until midnight Monday 31st August. Please read on for further content to promote onsite today. 20% off EVERYTHING plus FREE delivery at La Redoute! We got some fantastic news to share with you this afternoon - the launch of a new code for 20% off everything PLUS free delivery when you spend over £50 at La Redoute! This amazing offer won't be around for long so make the most of it whilst you can - offer ends Sunday! Our fabulous new AW15 collection is online which includes our new guest designer collection Etienne Deroeux, so fill your wardrobe with new season trends and make the most of our mid-week exclusive offer! Please get in touch with any extra promotional opportunities or questions. Offer Details: Wonderful selection of products. We have a fantastic line up of exclusive product launches, huge savings and competitions all throughout the duration of this week. Detailed below are some of the top picks to watch out for! About Us: At Ideal World we allow our customers to view our products from the comfort of their own home, with our designated television channel allowing customers to view products and how they work, as well as being able to shop directly on the internet, it is safe to say we are perfect for home shopping. We currently house many big name brands, including Nutri-Bullet, Bosch, Tefal, Zhuzh and many more! Ideal World is proud to say that it offers its customers a wide range of products at very competitive prices. If you have any queries regarding this offer then please contact me directly at lucy.white@idealshoppingdirect.co.uk. Dear Affiliates,Wex Photographic is for the first time doing Black Friday and Cyber Monday offers! Here are the details of our great offers for you to use and promote. The Deal: £300 OFF Canon EOS 5D Mark III - Our Lowest Price EVER! You can also find these offers on our Wex Photographic affiliate website site - voucher codes section. Please do not hesitate to contact me with any question! Have a great weekend & enjoy the sales! Last chance to promote this exclusive Sarenza code! Time is running out to promote our exclusive affiliate voucher code! The code is for AFFILIATES ONLY, so be sure to take advantage of this opportunity. This offer is in conjuction with Sarenza's advertiser of the month feature and exposure competition. The code is valid for 15% off 1st orders over £90 until August 24th. Banners are available in Darwin to promote the code--please don't hesitate to let us know if you require any additional sizes/formats. Please do not hesitate to contact us directly for more information about our offers. We are always happy to discuss opportunities for increased exposure in exchange for higher commission rates, for example. Feel free to get in touch if you would like to work more closely with Sarenza. I hope it is all going well. Driven Sports is about to launch a new pre-workout supplement to replace its popular 'Craze,' Driven Sport's best-selling product of all time. 'Frenzy' will initially be sold only through an online retailer that's based outside the U.S and we are pleased to announce that Predator Nutrition is going to be only and solo world exclusive distributor of Frenzie and Splyce. This is a huge step for us the demand for both products will be huge and it is highly anticipated. We are expecting to start stocking Splyce and Frenzy in 4 weeks’ time. Please remember to replace '!!!id!!!' with your own publisher ID. Please feel free to contact me with any questions, suggestions or for additional exposure opportunities. - All orders over £50 automatically upgrade to next day delivery. New exclusive code and competition from TP Toys. The Forest Wavy Slide and Sandpit has made multiple appearances in our top 10 best sellers items recently – and it’s no surprise why! This product is perfect for compact gardens where space may be limited. Featuring a classic wavy slide with the added play value of a sandpit, this product is already reduced to an amazing £69.99 from £124.95. And for the next 2 months we are offering affiliates an exclusive code to promote for an additional 10% discount off the sale price! Using the code EXTRA10 your visitors can get this popular Slide and Sandpit for just £62.99! We have banners available in our AWIN profile for you to use to display this offer. The discount code is valid until Thursday 12th December 2013. At this fantastic price, this Slide and Sandpit combo is a perfect Christmas present for children aged 3+ years! PLUS – Any publisher who sends us a link to show us this offer being promoted on their site will be entered into a prize draw to win an 8ft Trampeazee Trampoline! All entries must be sent to sarah.prestage@mookie.co.uk before 15th November 2013 and the winner will be selected on 30th November 2013. Pontins have created an exclusive, affiliate-only offer! This offer gives customers summer holiday bookings from £159 for selected parks 25th June ending 22nd July! This landing page is available for affiliates only!